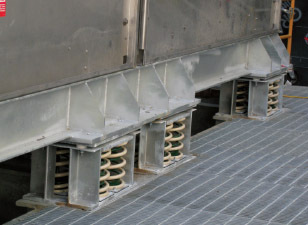 Seismic Restraint Isolators and Snubbers. ISAT and Kinetics seismic restraint isolators and snubbers. There is NONE BETTER for Engineering services, manufacturing and testing capabilities - all backed by the industry’s most experienced staff. 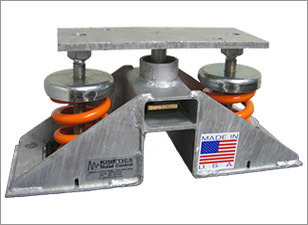 KINETICS™ TITAN Modular Seismic and Wind Restraint Vibration Isolator is comprised of two interfacing but independent elements; two or more high deflection, free-standing, housed, large diameter, laterally stable steel springs, and a seismically rated housing. 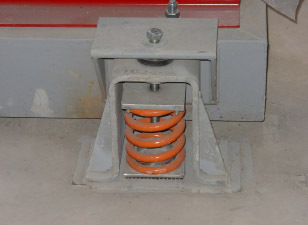 The steel springs are replaceable without having to lift or otherwise remove the supported equipment. The seismically rated housing is available in three (3) housing sizes engineered to resist nominal restraint forces of 0.5G, 1.0G, and 2.0G based on the max load capacity of the isolator model. Because of the extreme design flexibility of the modular concept, Kinetics Model FMS Isolators can be used effectively for large, heavy pieces of equipment in highly active seismic or wind prone areas as well as for more common applications in less active areas without financial consequence. 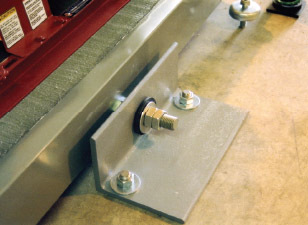 Ideal for equipment mounted on structural frame or concrete inertia bases. Because of the minimal vertical travel and near constant operating height, the FMS isolator is excellent for use on cooling towers, chillers, boilers or other equipment where the potential for wide weight variations during service is anticipated. Up to 4” deflection, powder-coated steel springs with 50% overload capacity. 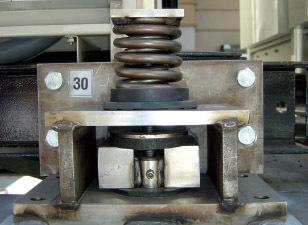 Vertically restrained spring isolators designed for higher seismic and wind forces. The housings are fabricated to limit vertical movement of the isolated equipment if equipment loads are reduced or if the equipment is subjected to large external forces such as high winds or seismic events. The housings also provide a constant free and operating height to facilitate installation. Up to 4” deflection, powder-coated steel springs with 50% overload capacity. Vibration isolation with seismic and wind restraint capabilities for mechanical equipment. Featuring all-directional restraint with vertical limit stops, field-interchangeable spring coils, galvanized housing and polyester powder coated coils and a constant free height and operating height. Up to 4” deflection, powder-coated steel springs with 50% overload capacity. Seismic snubbers are designed for use in locations subject to earthquakes or other external forces which could displace vibration isolated equipment. Rugged, heavy-duty products which have been designed to resist imposed forces from external sources yet remain out of contact during normal operation so that vibration will not be transmitted to the building.